OPINION: Could Kane Hemmings be the final piece of the Stags jigsaw? Could Kane Hemmings be the final piece in the Stags jigsaw for Steve Evans’ men? When you take a look at his stats it’s hard not to get excited with his goal ratio scoring one in every two games played. His most prolific season came in his spell at Dundee where he netted an impressive 28 goals in 41 appearances. His other clubs include Rangers, Cowdenbeath, Tamworth, Barnsley and Oxford. Evans had been after the frontman since May, having failed to sign the 26-year-old in the past from Dundee, stating that a deal could not be agreed. Huge credit has to go the Radfords for making the deal happen, showing their ambitions that we are aiming for promotion and moving the club forward. The deal is only a loan until the end of the season, with an option to buy if the club would want to make the deal permanent. It also worth noting that club did extremely well to beat off competition from Scottish teams, League One and League Two rivals for his signature. With the service we have in midfield, along with the other strikers we have at the club gives him the platform to score goals and give opposing defenders their worst nightmares. 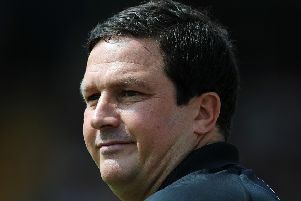 Still at only 26 he has a good track record at League One level with a proven track record. He will fit it nicely with the style of football that Evans has us playing alongside the likes of Rose and Angol, who will no doubt score us goals. The one thing that has impressed me most about this signing is he genuinely wants to come to Mansfield to not only help us in our promotion push instead of coming to earn a pay package. Evans has done extremely well to attract quality players having had promotions, Champions League and Championship experience on their CV to drop down to League Two. Hemmings will no doubt have a lot to prove, not only to the Stags faithful but himself, having not played a minute for Oxford this season being down the pecking order. He will be hoping to recapture his goal scoring form that we all have, in my opinion, been lacking since we have been back in the Football League. Good luck Kane. UP THE STAGS! !